SCHOLARS around the world speak of a family of Indo-European languages that spread from Central Asia westwards towards Europe and eastwards towards Iran and India. Note: they speak of a language, not a race. For example, everyone who knows English is not of the ‘English’ race. Yet, the idea of the Aryan race continues to be used in popular discourse by politicians and fiction writers. According to the first theory proposed by 19th century Europeans, Aryans were a super race, white and blonde, originally from Northern Europe. They were overshadowed by Greco-Romans first, and then Semitic races that practiced Judaism and Christianity. Memory of this super race survived in India too in the form of the Vedas, though Indians themselves had corrupted themselves with practices such as untouchability and idolatry. This theory fueled the rise of Hitler and Nazi Germany, and became distasteful to all after the Second World War. According to the second theory, popular among Indians since the 19th century, Hinduism is a corrupt form of the ‘pure’ Vedic age where ‘sanatana dharma’ was followed, where there were no castes and no idol worship. This theory disagrees with the idea that the Aryans came from Europe, or Central Asia. It rejects the idea of invasion, migration or foreign Aryans. It argues that Aryans originated in India and they spread all over the world from India to Europe and even the Artic. This theory continues to be popular, even among contemporary nationalist writers and novelists, who typically hail from North India, are from privileged communities and fair-skinned themselves. The third theory is from the South of India, which believes that Aryans may not be invaders or migrants or foreigners to India, but they are certainly North Indians who displaced South Indians from the Indus Valley cities. In this discourse, Ram is a white Aryan invader, and Ravana represents the leader of the dark-skinned southern tribes, whose father was Aryan and mother Dravida. 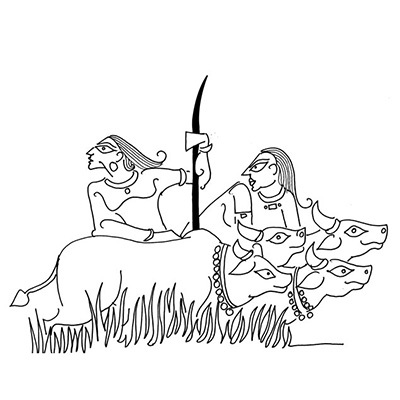 While many writers of the Hindi belt speak of how Ram upheld civilisation by driving out the threat presented by South-Indian rakshasas, Tamil writers have argued that Ram was the invader and Ravana, the local defender. The fourth theory uses Aryans to explain the caste system. Here, writers have claimed that Asuras were originally rulers of India before Aryan invaders took over the land and reduced them to servants (lower castes) or drove them into forests (tribes). This is the logic behind stories of Vishnu taking the form of a brahmin called Vaman to overpower the good king Bali-raja through trickery. This is the logic of white-skinned Durga defeating the dark-skinned Mahishasura, leading to the now infamous Mahishasura Martyrdom Day. The fifth theory equates Aryans and their Vedas with patriarchy and Brahminism. Before they came to the scene, India followed Tantra and society was more egalitarian and women had more power. The macho gods of the Aryans overshadowed the goddesses of pre-Vedic, pre-Aryan times, captured in stories of how Indra abused the dawn-goddess Usha. Thus the ‘Aryan race’ is leveraged to explain various social phenomena. Historians will mock at these racial theories, but they remain powerful myths that steer the course of history.